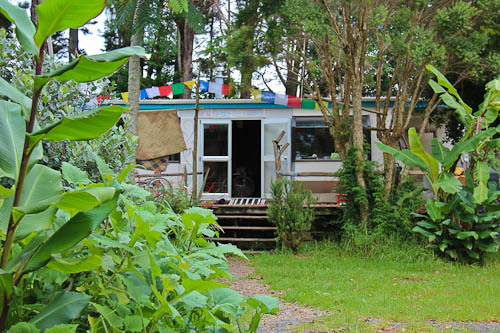 As we settle into our temporary base next door to La Hacienda and the Bush Fairy Dairy, we’ve relaxed into the casual, communal style of sharing food and our lives with whoever is around. 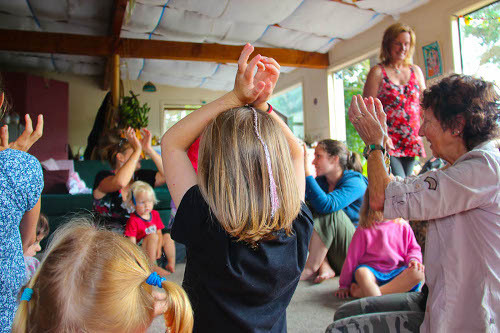 When our daughters attended the local playgroup this morning, I realised that unschooling is so far removed from structured learning environments — even if they’re of the Waldorf/Steiner variety! 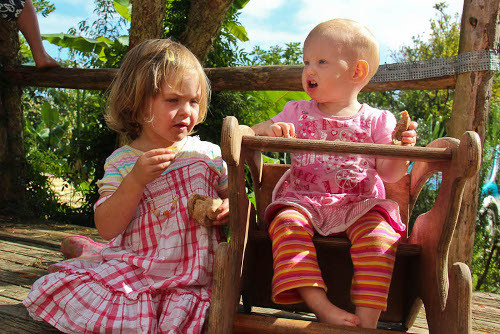 In the morning, we headed over to La Hacienda when a trio of little girls arrived at our campsite and invited us over. The local playgroup was setting up, and Johnny thought our girls may enjoy rolling some dough into buns for a snack later on. La Hacienda sits among trees and productive gardens, providing a magnetic space for the community to gather. We had spent Sunday cooking at La Hacienda, introducing ourselves to the steady stream of visitors to the house and watching the girls at play. As well as Johnny and Nathan, Brian is visiting La Hacienda and contributes to the work that needs to be done to maintain the property. David’s enjoying the opportunity to share his culinary skills with a larger group of people, and his food is always amazing. While visiting La Hacienda, it’s been lovely to sit and watch the girls play. Johnny shows a remarkably high tolerance for our daughters’ attention-seeking antics, and they’ve been thriving in this new environment. When I arrived at the house for playgroup, half a dozen families were spilling out, with young children running around noisily. Rainbow Kids is based on Rudolph Steiner’s philosophy of learning, so I was interested to what would transpire. We commenced by forming a circle around a table decorated with a tablecloth, flowers and a beautiful picture, and 4yo boy used a lighter to ignite the candle that formed the centrepiece. We sang and did the motions to a series of songs thankfully expressing joy at Creation. Many of the songs were unfamiliar to me, and even those that I knew (“A tisket, a tasket…”) are sung to unfamiliar tunes. After this, the adults initiated some games designed to promote group interaction. Often they called children from their games — trying to bring everyone back into the circle. It seemed that the mothers (and grandmothers) were more enthusiastic for the games than the children. After watching for a little while, Aisha was brave enough to join the circle and participate in some of the action songs. Many of the games involved chasing each other around (and through) the circle. Calista and Brioni preferred sit back and just watch. After the games were finished, we all moved outside into the lovely sunshine for a snack. 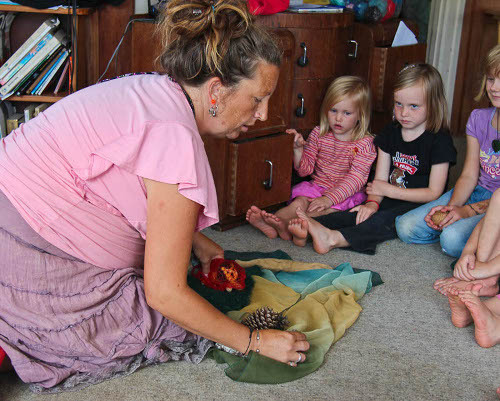 Tania used some little toys and fabric to illustrate her story — the children were spellbound by her narrative. 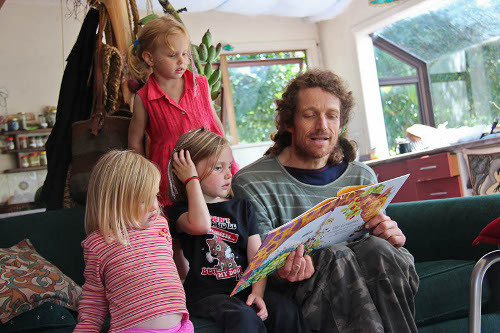 When the playgroup was over, and all the other children had left, our girls were happy to have Johnny to themselves again. It’s certainly been a long time since we’ve visited a structured playgroup. I was hoping that with the Steiner influences, this playgroup would be less structured than the ones we’ve known. Upon reflection, I’m surprised at how much our philosophy of child-rearing has changed since we last attended a playgroup. 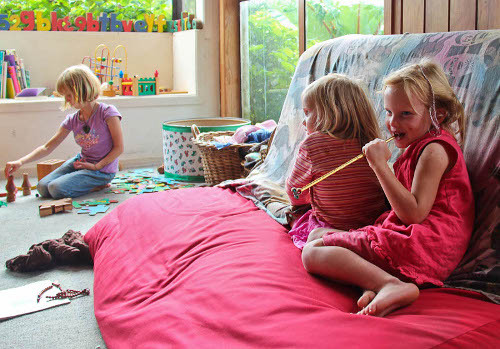 We have experienced the benefits of unschooling, and as we learn to let go of so much of what we controlled in our children before, a structured playtime seems artificial and limiting. As the children were moved into activities, I saw that they were being interrupted in their own games. When I’ve done this, one of my motivators has been to check off an invisible box that proves to the other witnesses that our children can conform properly. I think back on the times I’ve tried to limit our girls’ play, when I’ve pushed them outside to suit my own convenience or when I’ve interrupted their important games to foist my own ideas on them. I repent of insisting that like toys remain together, moulding our children into copies of my own obsessional self. Over the past couple of months, our appreciation for our daughters’ freedom has grown. As David and I have learned to let go of the areas we once controlled, resisting the fears that try to sneak in, we’re finding that our children are blooming in self-confidence and imagination. Instead of turning into out-of-control brats, as we seek righteousness first — manifesting holiness and love in our daily interactions — our girls are being shown how to make their own decisions to control the ego — the sin nature — within them. The theory doesn’t seem possible — quit controlling your children’s lives and they’ll work out a balance — but it works! We’ve found that our responsibility is to master our own selfish ego instead. We are learning to lead by example, to deny ourselves and to pursue righteousness, eschew fear and embrace the opportunities we’re given! wow thanks for this post. spoke to me, as kids are in a waldorf kindergarten. have recently been exploring unschooling. i see what you mean about interrupting their games, or forcing your will on them or just generally controlling them – its really in almost every single thing we do, under the guise of ‘teaching’. we do want our children to be truly nourished and thats what drew me to waldorf, but also want them to think for themselves, to feel free – not limited in their play, in their imagination, in their world. have seen how upsetting it is for dd or ds to be swept from one thing to the next with our busy busy busy lives and also looking to find better way of life. any thoughts on transition from one ‘structured’ world to one of freedom? any issues with fighting? have noticed that without boundaries children sometimes beg for them! are there still boundaries/structure in the life of unschooled children growing up in a family with such freedom? I guess its still the same, don’t hurt each other/treat others as you want to be treated, clean up after yourself (but no restrictions as to HOW to do the cleaning up), etc. But does it make the day hectic? or is there still inevitably a bit of rhythm to the day, just naturally? Thanks, Stacey, for your thoughtful comment. It’s inspired me to re-think the topic too. For us, the transition from a structured world to freedom came in steps. I can’t give you a formula to follow. They were natural steps where David and I agreed on what we were going to let go, and it happened one at a time as we became aware that we were stifling our children in each area. We haven’t had major issues with fighting, but we recognise primarily that our children reflect what they are learning from us, and if they’re possessive of an object, it’s because they’ve learned that from us (“Don’t touch my computer!”). So as we focus on getting our own hearts right and filling ourselves with love, generosity and positive energy, it overflows from us to our children and they reflect that too! Each day’s rhythm is usually dominated by adult chores… Meal preparation and clean-up, washing, shopping, etc. At the end of the day, the girls realise that I’m just about out of energy and if they want to stay up, I’m much happier if they leave me a lone… so we’ve moved into a no-bed-times phase. 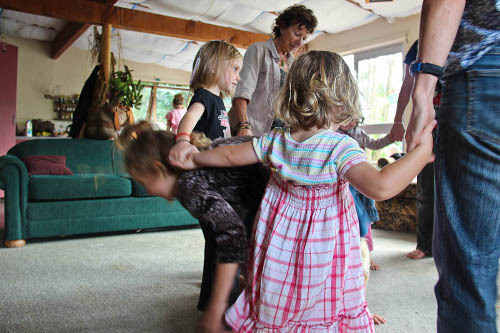 It’s working well — they’re sleeping in more and are self-regulating their own energy/life at an early age! Hope this helps! We’re learning so much… so fast… it’s an adventure! I don’t know if you get notifications of comments on old posts, but I wanted to explain what you saw. Steiner/Waldorf is a very controlling philosophy, more than any other I’ve explored. They are one of the prime culprits for the lockstep art projects where there’s a proud display of identical items which is apparently supposed to show creativity. I’m sorry you spent time trying to do performance parenting. Believe it or not, that’s not the way most others parent (I cry for how awful you childhood must have been for you to react against it so strongly). We participate in circle time not so that others will think some certain way about us, but to help our children develop executive function. This not only helps them in day to day life and learning, but in their games. The look of pride and accomplishment on my daughter’s face when she finished making a cipher key yesterday (after three gentle redirects from me to help her focus), or the fun my son has now he can sit through a whole game of uno or backgammon, or more importantly, compromising with a playmate so they continue to seek you out to play with are all due to their exective function. One of the things I’m most grateful for in my parenting are the scientific resources we have now so we can really understand why our kids do certain things. Learning about executive function has been one of those things for me. There are also an incredible series of books you can buy in e- versions which take you through the development of each age. I spent so much time thinkng my kids were odd before I read these books!!!! If you had a mailing address I’d send my copies to you. There is also “Einstein didn’t use flashcards”, which is good ( not as essential as the Ames and Ilg books). I think I might comment on your latest post, just so you don’t miss this. It’s life changing!